The Elbow Scheme was introduced in 1993. This scheme involves x-raying the animals elbows at 12 months of age. The presence of a united anconeal process and arthritic changes are recorded. The x-ray plates are then submitted to a radiologist to be read and graded. The gradings are Normal, Near Normal & Grade 1. 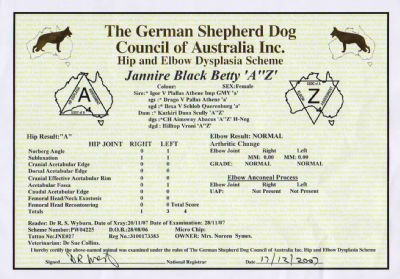 A dog receiving these gradings passes the scheme and is given the 'Z' stamp. As from the 1st July 2014 GSDs receiving Grade 2 grading through the GSDCA ED Scheme with Osteophytes of more than 2mm to 5mm will not be recommended for breeding & will fail the scheme.